Ah, chess. It is easily the most popular strategy game known to mankind. There are so many different versions of the game that pertain to so many different nations and cultures that it is hard to keep track of them. Even so, the essence of a classic game of chess remains the same. Let us delve into the history of this prestigious sport and find out a little more about its origins. Who Discovered the Game of Chess? 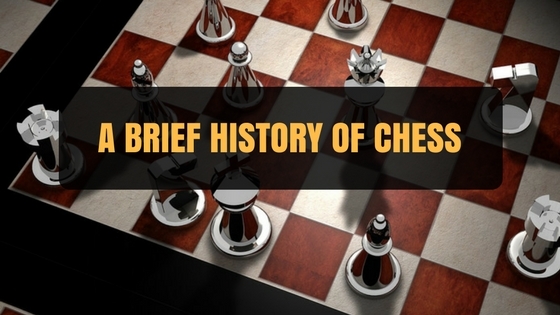 The history of the game of chess as we know it today is still quite murky. In a nutshell, chess is a game that has just happened to be there since the beginning of civilization in some form or the other and we have always embraced it. Is there one person to whom the invention of the classic game of chess can be attributed? No, there is not. If there is one such person, he was probably not a prominent, historical figure and that is why there is no name or specific identity we can associate him with. There are, of course, a couple of interesting stories about how this magnificent game originated that we can touch upon today. One such story, which is probably the most widely known one, involves an Indian King known as Shih’ram. In the Kingdom of this ruler, there lived a wise man, often referred to as a mathematician or a strategist, who invented the game of chess and presented it to the king as a fitting way to pass his leisure time. The king thoroughly enjoyed this game and encouraged everyone in his kingdom and in his court to play it. As a reward, he offered to grant any one wish the man would ask of the king. The man, wise as he was, asked the king to simply rant him some wheat, but there was a catch: The king was to offer the man one grain of wheat for the first square on the chessboard, then two grains of wheat for the second square, and then keep doubling the number for every square on the chessboard. Confused and a little agitated, the king nevertheless decided to honor his wish. To the king’s surprise, he realized that there was not enough wheat in the entire land to honor the man’s wish! Impressed by the man’s wisdom and cleverness, the King made him an advisor. Another tale of Indian origin talks about two brothers, Talhand and Gav, both of whom were contenders for the throne of India. The two brothers had met in battle on elephants and Gav gained victory over his brother who died a woundless death. The mother of the two brothers was devastated that Gav had killed his brother. Gav, on the other hand, was adamant on telling his mother that neither he nor the elephant had had a hand in killing Talhand. To ease the sorrow of the mother and bring the argument to rest, the wise courtiers of the kingdom invented the game of chess so that they could decipher the possible ways Talhand could have been killed. There is yet another tale that lies in Hindu folklore about the origins of chess. It suggests that the wife of the Demon king Ravan invented the game so that Ravan would wreak less Havoc on the world and use his strategic mind on the chess board instead. There have also been some theories about China being the land where chess originated, but these are not as convincing as the other theories. These theories revolve around the Chinese games of strategy like Backgammon, which uses dice, Xiangqi and Shogi. These strategic games, though very similar to chess, have different roots. So far, the theory that most scholar’s hold true is that Chess originated in India as Chaturanga, then was carried to Arabic lands as Shatranj, and then made its way to China and Europe. Archaeological findings have uncovered the oldest chess pieces and boards from the sites of the Indus Valley Civilization, Mohenjo-Daro, and Harappa, dating back to 200 BC. The term checkmate originated from the Persian word ‘Shah Mat’ which means “the King is dead”. The moves of the Queen, Bishop, and pawn have changed throughout the course of history in chess. For example, in earlier versions of chess, the pawn could only be upgraded to the Queen. The intricate pieces of chess started off as carved shapes of animals. After chess spread to Arabic lands, these animal shapes gave way to abstract shapes because animal depictions in art were forbidden in Islam. 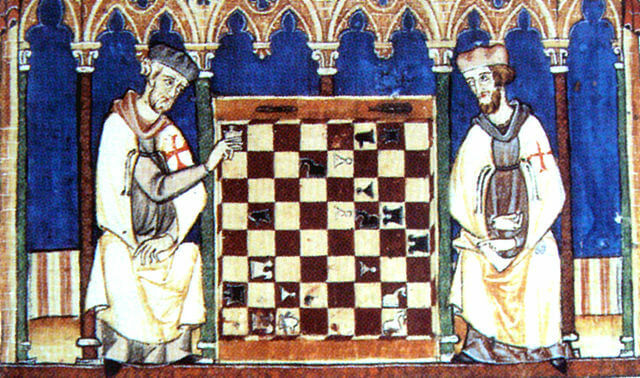 The modern-day chessboard with alternating light and dark squares originated in Europe in the 11th century AD. Before the mechanical clock, players used a sandglass in their games of chess. In the Arabic game of Shatranj, the Queen as we know it was the vizier. In some lands, the Queen is known as the vizier even today. Most likely, chess originated in India during the Gupta Empire. Then, the game was taken to Persia after it had been played for a couple of centuries. As the story goes, an ambassador from India went to the Persian King Chosroes with the game. He presented the game to the king on an ornate chessboard and asked him to solve the mystery of the game overnight with the help of his courtiers. If Chosroes had solved the mystery of the board, the Indian King would pay him a tribute but, if he failed to solve the mystery of the board then he would have to pay tribute to India and admit that the Indians are far more intellectual than the Persians. According to some historians, a courtier by the name of Bozorgmehr had bribed some men of the Indian ambassador and weaseled out the rules of the game from them. He then presented the solved mystery to the King who rewarded him generously for his intellect. From Persia, the game made its way to Arabic lands and then finally landed in Europe. The Arabs had changed the shapes of the pieces to fit in with their culture. The Europeans changed the moves of some of the pieces like the Queen. Previously, the Queen moved only one square diagonally. They also changed the moves of the bishop and the pawn and they introduced the light and dark board with alternating squares in the mix as well. When the game made its way to China, it is believed to have evolved to Xiangqi but some historians say that the roots of Xianqi are different from that of chess. Later in the 19th century, some of the best chess players in the world were introduced. In the 20th century, there were chess-playing computers like Deep Blue which revolutionized the thinking processes of the players. Though we may not agree on the exact history and origins of the game, we must admit that rarely does anything survive the test of time like the game of chess has.